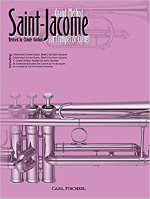 Saint-Jacomes Grand Method for Trumpet or Cornet is one of the two great pillars of trumpet methodology along with Arbans Complete Conservatory Method for Trumpet (Cat. No. O21). The Grand Method has provided trumpet players with the necessary foundation for success on the instrument for generations since its publication in 1870. This edition contains the recently discovered revisions by Claude Gordon. Gordon has added clarifications and some contemporary considerations, yet is careful to retain the intended instruction of Saint-Jacome. Furthermore, this edition includes Duets and Studies by Saint-Jacome and Bousquet, all edited by the legendary bandmaster Edwin Franko Goldman. Now spiral bound for ease of use, students of any age can continue a tradition of excellence passed on through generations.